“Michael Bjerknes, a former Washington Ballet dancer and ballet master and co-founder of the American Dance Institute in Rockville, died April 14 of colon cancer at the Washington Home and Community Hospice. He was 51. Mr. Bjerknes, a Bethesda resident, also was a soloist with the Houston Ballet and a principal dancer with the Joffrey Ballet, as well as a guest artist with the Royal Winnipeg Ballet in Canada and the Northern Ballet Theatre of England. Agnes de Mille, Robert Joffrey and Choo-San Goh choreographed original roles for him. After Mr. Bjerknes stopped dancing, he became a teacher and ballet master at the Washington Ballet and the Universal Ballet in Seoul. He was an influential creative force in the Washington area for the past two decades. In 2000, he and wife Pamela Bjerknes, a former member of American Ballet Theatre, founded the American Dance Institute, a thriving school and performance space. The institute came about at an opportune time, the couple told The Washington Post shortly after its opening. Pamela Bjerknes, then 46, was looking to expand her private teaching career, while her husband, then 43, was not eager to be a peripatetic artistic director, his next logical career step. Their three children also were in school. “I have a limited ability to become a bohemian again,” Mr. Bjerknes told The Post. Click here to read the rest of the Washington Post article. 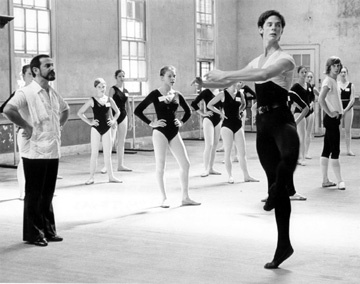 To read more discussion on Michael, visit the board on Ballet Talk; click here. Previous articleWhy are there no Black Ballerinas?